NOTES: Short run kit with etched brass and resin parts. The Sud Aviation (SNCASO) S.O. 4050 Vautour II was a French bomber, interceptor, and attack aircraft used by the Armée de l'Air (AdA). Later, 28 of these aircraft were used by the Israeli Air Force. Vautour is the French word for the vulture bird of prey. In June 1951 the French Armée de l'Air issued a requirement for a jet aircraft capable of acting as a bomber, a low-level attack aircraft, or an all-weather interceptor. SNCASO adapted its existing S.O. 4000 for this purpose, the first prototype S.O. 4050 making its initial flight on 16 October 1952. Subsequently named Vautour II, the aircraft was built in three versions. It entered service with the AdA in 1958, with the last French aircraft leaving frontline service in 1979. A few soldiered on in various duties into the early 1980s. 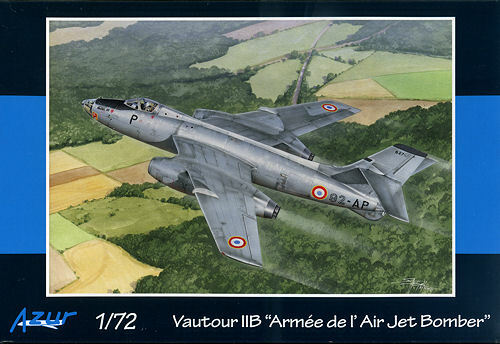 The Vautour saw no combat in French service, and it was maligned as obsolescent and underpowered. Although a decent aircraft for its day, it never received sufficiently powerful engines. As an interceptor it was outclassed by the Dassault Mirage III, and as a bomber or attack aircraft its lack of an advanced navigation/attack system was a crippling limitation. The only export customer for the Vautour was Israel, which purchased 28 of the ground attack and night fighter versions for the IDF/AF. The Israeli Vautours also entered service in 1958. They saw combat against Egypt beginning the following year and in a series of actions through the Six Day War and War of Attrition. The Israeli Vautours took part in bombing, strafing and air-to-air engagements. In the Six Day War, over three days Vautours fought repeated combats with Iraqi Air Force fighters while raiding H-3 airfield in Western Iraq. On June 6, 1967, Captain Ben-Zion Zohar scored the type's only aerial victory when he downed an Iraqi Hawker Hunter, although two Vautours fell to the guns of Iraqi Hunters on the following day. In all 15 Vautours were lost . They were retired in 1971 in favor of the A-4 Skyhawk, and the last aircraft left service in March 1972, serving as decoys in the Sinai. The Israelis were pleased with the Vautour's range and versatility, and it was well regarded in Israeli service. When I first heard of this kit being released, I went to several locales to order one, only to find out that it has sold out. Figuring I had missed my chance, I forgot about it until seeing one at a rather good discount so picked it up along with a few others that were on sale. The molding on the kit is as good as on any current kit from the MPM stable of names. Nicely engraved panel lines and well done clear bits with reasonably proud frame lines that are so important when one is masking these things. There are some small ejector towers on the inside of the large parts, a typical feature of short run kits. I did not notice any depressions in any bits, which is nice. 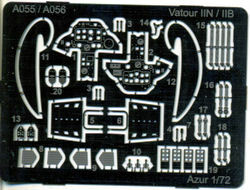 The sprues cover a number of variants so there are parts you will not use. Thanks to the lack of the gun nose, you can only do the IIB from this boxing. The Vautour is not a small aircraft so there is a lot of room for interior detail. Azur provides that with a nicely done cockpit section and bombardier section made up of several flat pieces that are joined together to make the various compartments. The etched fret contains quite a lot of the interior detail such as belts, rudder pedals, instrument panel face and other small bits. Photo-etch is also used for the wing fences and what appears to be bits for the speed brakes. Wish I could be more specific, but my instruction sheet is missing two pages of construction and so I do not have a complete picture of what goes where. The resin provided is for the engine intakes and exhausts as well as a lot of small stuff like scoops, oleo scissors, the lower fork of the nose gear, mounting points for the outrigger gear and the like. The resin is very nicely cast though with all the very small bits, I am sure some of those will disappear as offerings to the carpet gnomes. One thing I noticed is that the kit provides separate hinges for the various gear door s. I like detail as much as the next person, but to me this is being fiddly just to be fiddly. There are times when I think that kit makes seem to lose sight of their market. It is OK to combine some tiny pieces in with larger ones to help ease construction. Make the fiddly stuff optional for those masochists who wish it! Instructions are well done with smaller detail drawings to show where the bits are to go. As I mentioned, my sheet had nothing printed for page 5 and page 8, but a visit to the CMK e-store resulted in scans of the sheet so I was able to complete the instructions. There are four markings options. All of these planes were unpainted metal with black anti-glare panels on the nose. There was only one operational unit that used the Vautor IIB and that was EB.92. Both I/EB.92 and II/EB.92 are covered on the decal sheet. Prior to using the codes on the aft fuselage, the units used large nose numbers with the tricolor rudder markings and one of those is an option as well. 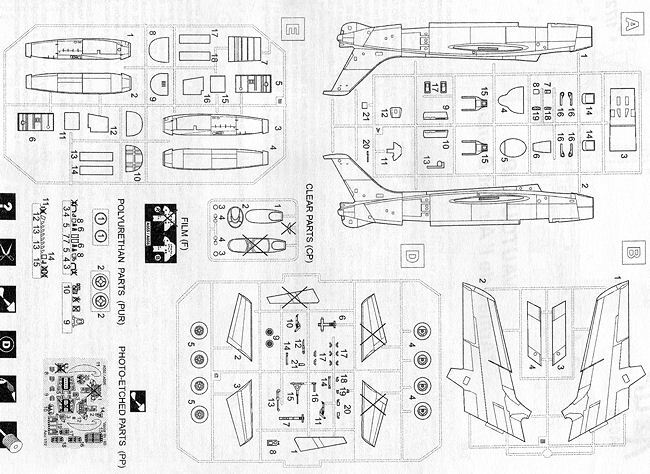 The fourth option is for a target tug unit, which used all variants of the Vautour at one time or another. 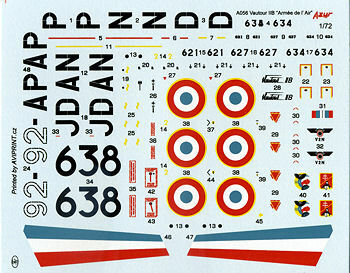 The decal sheet that is provided is very nicely done by Aviaprint and should be quite thin. Those of you who, like me, have been looking at their 1/48 FM kit with dread now have another and possibly easier to build option. Of course, those with the Heller 1/50 kit have that, but I doubt it has the sort of detail you would like. This is another nicely done, but fiddly short run kit from the gang at MPM/Special Hobby/Azur and is most welcome. Thanks to me for spotting this one on sale and picking it up. Thanks to If you would like your product reviewed fairly and fairly quickly, please contact the editor or see other details in the Note to Contributors.